I found this video in Google Video today – It’s CBC radio’s the current with video added from an old episode of The Transformers. I can only assume it was created by Cambrian House, the topic of the original CBC video based on the attibution Google video has. In this episode of The Current Maureen Taylor discusses “Crowdsourcing” with guests, including Jeff Howe, Contributing Editor for Wired Magazine, Cambrianhouse CEO Michael Sikorsky, and Russell Kord, a professional stock photographer.Cambrianhouse was also in the news recently when they dropped off 5000 pizzas for Google staff. Apparently people are interested in this thing. Digg.com has been mentioned numerous times at every conference I’ve been to this summer: Random people talked about it in presentations, Keynotes including Tim Bray of Sun, BlackBoard’a CEO Michael Chasen and David Weinberger (of the Cluetrain Manifesto) all mentioned it. At WebCT’s Chicago conference this year someone asked me about Digg while I was reading stories on my laptop and asked if I was reading it in responce David Weinberger’s keynote. I totally shot him down and said “um, I’ve had an account for one, no, I guess, two years now — since December 2003″ .. back peddling I added .. “but it’s great and I’m glad David Weinberger mentioned it.” not realizing that he clearly had only learnt about digg a day ago. I read digg almost every day with the username mattclare – I keep the main RSS feed in my Firefox toolbar. In fact, I’m trying to track down more interesting people who read digg because with the recent growth of articles I find it easier to view the “What your friends are digging” page than the main page. Digg is bigg and it deserves to be, it has become a great technology news site and with its latest revision it has become an OK general news site (though I still prefer news.google.ca). If imitation is the highest form of flattery than digg’s been collecting a lot of votes in that category too. Netscape just cloned it and Netscape’s boss Jason Calacanis offered to pay $1000/month to Digg’s top posters (and those on Newsvine, Flickr, Reddit, and del.icio.us) to post on netscape.com‘s ripoff Digg page instead – apparently the people who aren’t smart enough to change their default home page also aren’t smart enough find and submit articles. First head over to the flickr home page of the person or group you would like to subscribe to and find the feed at the bottom of the page. Follow that link or right (ctrl) click it and copy the URL. Next open iPhoto and find “Subscribe to Photocast” in the File menu. Past the URL (Command+V) into the space provided and press subscribe. You should now be subscribed and able to view and work with these photos.Â iPhoto should check for new photos when you launch it or when you press the little refresh circle. I upgraded my phone to a RAZR yesterday. It’s still on Telus, so same number, but the fancy Motorola RAZR V3c (c for CDMA, not the GSM technology the rest of the world is on) is like a Ferrari with a ford engine. I have upgraded my plan and now can check my E-Mail from my phone and send mail from it. Which includes sending mail to my flickr account, the following being the first. Excuse my nose. Monday of this week I had a full day (baring the time I spent responding to frantic E-Mails from Brock) to explore Chicago. I used this opportunity to head out to Wicker Park. On the Blue Line El’ on the way from O’Hare to downtown I noticed that there were a lot of nice lofts, cools shops, and lots of young people in Chicago. I took note of the ads too: Mac tech support and Johny Walker – an F1 sponsor. When I got off the El’ at Division station I realized that this was the neighborhood I was looking at on that first El’ trip. 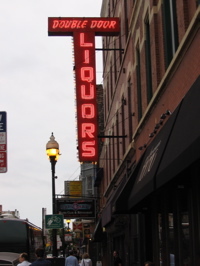 Wicker Park is where the Double Door is – the club that hosted all the hot acts in the late 90s grunge music scene. The Double Door also hosted a lot of Smashing Pumpkins show, including the last (for the moment) show. I’ve always been a really big Smashing Pumpkins fan (not in a Kiss Army kind of way) and to see the Double Door was pretty cool. Tuesday brought rain and all I managed to do was visit the United Center (home of the Blackhawks) and do a little meaningless shopping and ultimately register and attend the start of the WebCT !mpact 2006 conference. One last experience I want to share is about stereotypical Americans – there aren’t that many and I’d suggest that the stereotype (at least in this Democratic city) is the exception, not the norm. American’s aren’t all overweight – but those that are, they enjoy the freedom to really be obese. One last note is an old woman (70+) who I met standing in the rain just beside the Christian Science reading room. You are currently browsing the iMatt :: The Blog of Matt Clare weblog archives for July, 2006 .